Who Mourns for Adonis? (Episode 33) We do. Leonard Nimoy, actor, best known as 'Mr. Spock' in Television and Movie's "Star Trek", died today at age 83. The beloved star of the hit, but short lived TV series indeed lived long and prospered. 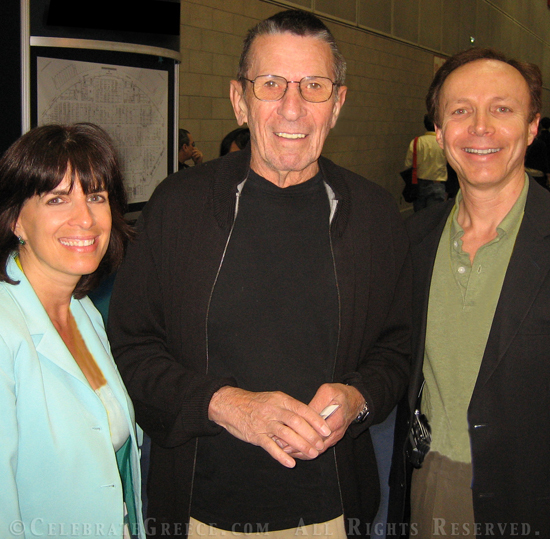 Pictured: Nimoy meets up with CelebrateGreece.com's Cynthia Daddona and Dr. James Stathis (rt). Speaking at BookExpo, Nimoy asked Dr. Stathis for what the huge line forming was. Dr. Stathis said, "William Shatner (Star Trek's Capt. Kirk) is signing books." "Oh, Bill's here too?" I remember standing with Nimoy looking at Shatner's line of people waiting for autographs. If any of them had just turned around they would have encountered Spock as well. As it was Nimoy was heading for another booth to sign his book. As he left us he was noticed by someone at which point pandemonium ensued and Cynthia and I escaped the other direction. If only Star Trek 3, The Search for Spock, were possible. Live long and prosper. Nice to see your tribute. I too mourn Mr. Nemoy/Spock, along with many others I am sure. I never had the pleasure of meeting him but, in a strange way, he was a part of my life. I will remember and be influenced by him.